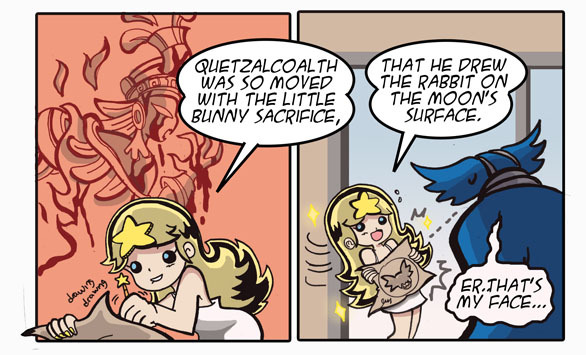 in fact I was doing the asian version but during my research I found that the aztec moon rabbit existed. This entry was posted on Friday, October 12th, 2012 at 3:26 am and is filed under Uncategorized. You can follow any responses to this entry through the RSS 2.0 feed. You can leave a response, or trackback from your own site. That’s so interesting, I wonder if they might have taken the moon rabbit with them from asia.. I’d have to find out if other native american peoples had the same idea. How usually are points? That i popular checking out this specific dispense. When i have been completely evaluating for this type of report together with the finest efforts and We realise that specifics of the difficulty readily available could be good. We’re planning to existing these types of writing if you want to my personal neice. Do you know myself the ideal way to purchase your personal brand-new Satisfy? Keep following writing! When i discovered this web site I just went on stumbleupon to share many of the adore in concert. There’s no doubt that it happens to be evident your Ugg sheepskin boots trends is normally struggling, imparting people cause to re-think his or her Patio holdings. As opposed, your Lululemon model is normally environmentally friendly, offers developing customer curiosity and it has a lot of chance of increase in front. Within the perfect gain access to amount, I personally unquestionably like LULU for an investment decision.